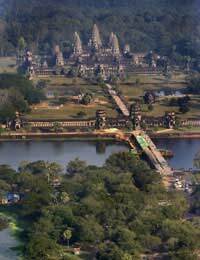 Cambodia is a very popular tourist destination in South East Asia. It could be described as one of the less developed of its South East Asian counterparts, and for this reason retains much of the tradition, custom and architecture from its rich and colourful past. Although the country is very welcoming to outsiders and westerners, those visiting even the most populated tourist areas should observe some fundamental aspects of Cambodian customs and etiquette. Most of the population of Cambodia follows the religion of Theravada Buddhism, which is reflected in the hierarchical yet collective nature of Cambodian society. It is believed that society should interact harmoniously, for example groups, community or the collective being of more importance than the individual. Of course, this ethos is extremely prevalent in the way in which Cambodians communicate. Because Theravada Buddhism places emphasis on the concept of 'face' - for instance saving face or losing face - you may find that Cambodians are gentle, understated, gracious, courteous and complimentary people. It is very important for a Cambodian to retain his or her dignity, and so embarrassing, shouting, cursing at or exposing someone is extremely bad etiquette - doing this would result in a loss of 'face' for your counterpart, but might also reflect badly on you. The idea of the collective and the hierarchy also extends to the way in which Cambodians will greet each other. Cambodians are very aware of interpersonal relationships with prominence given to the respectful interaction between those of differing rank and superiority. For instance, a pupil should always be respectful and honorific toward their teacher, as should a child to their parent. This idea extends to all aspects of society, from religious monks to company workers. When meeting a Cambodian for the first time, you should ideally wait for your counterpart to initiate the greeting. Some Cambodians may offer a handshake, as they may have a lot of contact with westerners. In this instance it is polite to accept the handshake. However, the traditional greeting that you may be met with is to put both hands together as if praying at chest height whilst bowing toward your acquaintance. It is thought that the lower you bow and the higher you raise your hands in the 'prayer' action, the more respect you are offering. If you are met with this greeting you should return the greeting in the same way. You may also find that whilst a man offers a handshake, a woman will retain the more traditional form of greeting. Again, the proper etiquette in this instance would be to simply return the greeting. When referring to an acquaintance, the proper etiquette in Cambodia is to use the honorific title, followed by the first name, or in more formal instances the first and second names. The honorific title for a man is 'Lok', and 'Lok Srey' is used for a woman. Remember that the first name is the family name (the western equivalent being the surname), and the second name is the given name (Christian or first name) - generally Cambodians do not have middle names. If you should be invited to dine with Cambodians, you will generally find that dining etiquette is similar to that of western rules. However, you should always be mindful of the hierarchy of who you are dining with, and as a sign of respect, always wait for the oldest and most senior person present to be seated. It is also proper etiquette to wait for the oldest or most superior person present to begin eating before you tuck in. Failure to do so may come across as ignorant, greedy and disrespectful, resulting in embarrassment! Gift giving on such occasions is fairly common, so bringing a small and well-presented gift would be well received. Remember that Cambodians do not really celebrate their birthdays, so gift giving in this instance is not very frequent. Never present a Cambodian with the gift of a knife, as this is regarded as the severing of a friendship or a relationship. Similarly, the colour white is associated with death and mourning, and so white presents should be dually avoided. If you find that a Cambodian acquaintance presents you with a gift, the proper etiquette is to not open the gift in the presence of your counterpart.